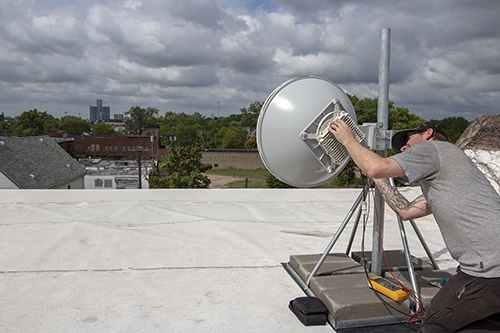 The Detroit Community Technology Project, which promotes digital literacy, education, and creation through multiple programs, including the Equitable Internet Initiative and Digital Stewards, has partnered with 123Net in Southfield to distribute Gigabit internet connections to at least 150 homes in Detroit. The partnership consists of six 1 Gbps connections from 123Net to three neighborhoods that are part of the Equitable Internet Initiative: southwest Detroit through a partnership with Grace in Action; Islandview in southeast Detroit through a partnership with Church of the Messiah; and the North End through a partnership with the North End Woodward Community Coalition. Digital Stewards, community members who are trained by DCTP in technical skills and community organizing, distribute and maintain the connections throughout the neighborhoods. The Digital Stewards share a passion for digital literacy and a desire to expand their own knowledge base. 123Net, an internet service provider focused on equipping businesses with industry-leading data center, voice, fiber, fixed wireless, and other network services, says it is excited to partner with DCTP through its Equitable Internet Initiative. “We know that in a city so poorly connected, our residents won’t be able to attain the opportunities, education, and careers that they deserve to pursue,” says Dan Irvin, CEO of 123Net. “The Detroit Community Technology Project focuses on preserving the rich culture of the city by progressing the digital literacy of the population, and we saw an opportunity to use our infrastructure successes to advance that goal.